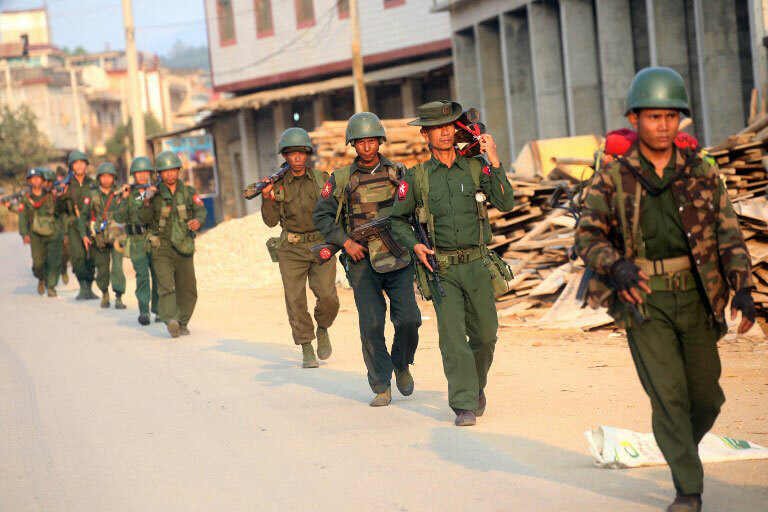 Myanmar soldiers patrol in Laukkai, the main city in the Kokang region of northern Myanmar Shan state, on February 16, 2015. Three ethnic rebel armies in northeastern Myanmar’s Shan state vowed Wednesday to support a new government led by Aung San Suu Kyi’s National League for Democracy (NLD) party, which swept general elections earlier this month. The Myanmar National Democratic Alliance Army (MNDAA), Ta’ang National Liberation Army (TNLA) and Arakan Army (AA)—which have been fighting the military in Shan state’s Kokang self-administered zone—said in a joint statement that they would support an NLD government in the interest of ending conflict and building a federal union. MNDAA spokesman Tun Myat Linn told RFA’s Myanmar Service that the three rebel armies are willing to trust the NLD. “We released this statement after we made our conclusions based on the current state of fighting and the political situation,” he said. The MNDAA, TNLA and AA were not invited to join a nationwide cease-fire agreement (NCA) signed by eight ethnic armed groups and President Thein Sein’s ruling Union Solidarity and Development Party (USDP)-led government on Oct. 15, but had expressed interest in doing so. Wednesday’s statement came as the government lifted martial law amid an end to fighting in the Kokang region, where clashes erupted in February and led to a surge of violence in the region. The Kokang conflict has killed several hundred Myanmar soldiers, and spilled over the border with China in March to claim the lives of Chinese farmers. Reliable figures for casualties are unavailable. Martial law had been set to expire on Nov. 17 and the government did not renew it, citing a restoration of law and order to the region. Hostilities continue in eastern Shan state, however, where Myanmar’s military is bombing positions of the Shan State Army-North (SSA-N)—another rebel group that did not sign the NCA—in Monghsu township. The military reportedly deployed a helicopter gunship to fire on the rebels over the weekend. Clashes between government troops and the SSA-N have lasted for more than a month in the region and caused some 10,000 residents to flee their homes out of fear for their safety. The two sides had a cease-fire agreement in place from January 2012, and both blame each other for the outbreak of new fighting. Sai Kyaw Zayya, a Shan state lawmaker, told RFA that the recent fighting near Monghsu had displaced hundreds more. “Highper and Wamwamt villages [in Monghsu] have more than 1,000 refugees and it is difficult to help them because that area is close to the fighting,” he said. Sai Kyaw Zayya said that civil society groups have been supporting the displaced, but only had enough food to feed them for 20 days, and the government was unwilling to provide any assistance. “We want an end to the fighting,” he said. On Wednesday, Shan State Progress Party (SSPP) spokesman Col Sai La called on Thein Sein to stop hostilities against the SSA-N—the SSPP’s armed wing—noting that although the government-backed Union Peacemaking Working Committee (UPWC) was instructed to negotiate a truce, talks have yielded no results. A day earlier, leaders of the Shan Nationalities League for Democracy (SNLD) and the Shan Nationalities Democratic Party (SNDP) asked the president to end the fighting in Shan State as soon as possible and to assist displaced residents during a meeting in Yangon. The military’s escalation in Shan state has spilled into southern Kachin state with government troops launching ground attacks, and helicopters and fighter jets firing from the air on rebel Kachin Independence Army (KIA) soldiers in Mohnyin township since Nov. 14, according to local media. KIA spokesman La Nan told the Democratic Voice of Burma that the clashes were some of “the fiercest in the history of fighting” between his group and government troops. The number of casualties from the engagements was not immediately available. San Aung, a member of the nongovernmental organization Peace Coordination Group, told RFA that the military was still attacking the KIA on Wednesday, including with planes, had ordered residents to leave the area near Mohnyin, and had arrested around 10 people in the township. “People are in trouble as they can’t get to their farms,” he said, adding that there was no plan in place to care for the displaced. He said his group plans to notify the government-affiliated Myanmar Peace Center in Yangon about the fighting and suggested that there is a disconnect between Thein Sein’s administration and the military that has led to the recent fighting. “In order to avoid fighting in the future, the military and the new government will have to hold serious discussions,” he said. San Aung said the KIA has maintained a tense relationship largely because Thein Sein’s administration is comprised of former military generals who “simply changed their uniforms” after taking power from the former junta in 2011 following elections widely viewed as neither free nor fair. Reported by Kyaw Thu and Kyaw Kyaw Aung for RFA’s Myanmar Service. Translated by Khet Mar. Written in English by Joshua Lipes.